Today's Draw Classic*: Death from the Darkana Tarot by Janden Hale. Does the thought of death scare you? Is the fear of making change greater than the fear of dying without making those changes? What do you think happens when you die? 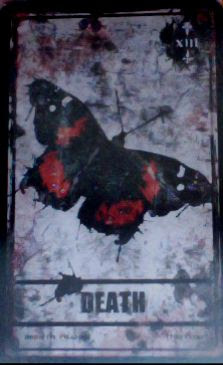 To begin with, Death is represented by a butterfly in the Darkana deck because the meaning of the Death card is transformation, not physical death. Just as the butterfly changes from caterpillar to butterfly, we go through transformations and makeovers and do-overs in our lives. But the topic suggested to me DID have to do with physical death. And it's about what we would do if we only had months to live. One of the things that happens when someone important dies in our lives is that we tend to ask ourselves questions like....What if this were the last year of my life? What would I change? And why would I wait until I'm dying to make those changes? I have to admit that, thinking I was dying, I would quit work, rack up lots of debt, sleep a lot, spend a lot of time in nature and arrange for my dogs. If I were physically able, I would go to the Grand Canyon. That's if we're talking months. Faced with the fear, but not inevitability of death, I would probably make some of the changes I want to make...take some of the risks I don't feel comfortable with now. I think I would probably turn off the TV and use my time more wisely. That's a change I can make now...without fear. But a lot of the changes I want to make in my life would be LESS practical if I were sick...like would I move to another state and leave my support peeps behind? I don't think so. In my head, I would think the threat of dying would change a lot for me, but now I've thought of it, I'm not so sure. Just as money keeps me a little tethered at this time, the illness and practicalities of disease would keep me tethered if I were sick. When it comes down to it, the things I most want to change are my career and my home and those things probably wouldn't change if I were sick. I already spend enough time with the critters I love most. I'd probably write more for myself. I'd certainly take better care of my health, which would probably be the biggest—and most ironic— change I would make. I don't know...that's all I got. What about you? What would you eliminate or add to your life if you knew it was limited? To answer the other questions, I think if I were honest, I'd have to say I'm afraid of the process of death..the unknown. But I'm also afraid of dying short of delivering on whatever promise I made coming down here. I suppose that's either impossible or easily forgiven in the afterlife. I guess I want to find that I've been an overachiever down here, you know? All that said, while the human in me fears the act of death, I do believe that part of me is immortal and will actually be set free like a butterfly emerging from a cocoon upon death. So I shouldn't be afraid. How about you?